Usually held during the summer, the Robert G. Ingersoll Oratory Contest honors the famous 19th century speaker known as The Great Agnostic. The event is held on Dupont Circle in Washington, DC. Contestants compete for prizes awarded from a panel of judges by delivering a brief excerpt from Ingersoll’s works. 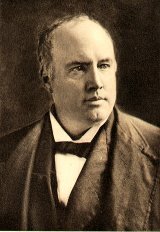 Ingersoll was an advocate for racial equality, birth control, women’s rights, Darwin’s theory of evolution, Shakespeare, free speech, and voting rights for Washington, D.C. His most popular speeches were openly critical of religion and the Bible while advocating a humanistic philosophy. He delivered more than 1,200 speeches to packed houses across the country in the late 1800s, all of them documented in a 12-volume set of his works. After he moved his family to Washington in 1878, he lived, worked and spoke here for seven years. He was a Civil War veteran and a very successful lawyer and political speaker. He is buried in Arlington National Cemetery. Yet he has been neglected and largely forgotten by history. Organizers created this contest to revive his message. The free event is open to the public. All are invited to bring a blanket or chair and applaud their favorite selection or speaker. A backup indoor location is reserved in case of rain. Questions? Send an e-mail to Ingersoll@wash.org or call and leave a message at 202-657-6346. Photos and videos of previous contests can be found on this website. The contest is sponsored by Washington Area Secular Humanists, Center for Inquiry DC, the American Humanist Association, and the Robert Green Ingersoll Birthplace Museum, a project of the Council for Secular Humanism. Is the video of this event available for viewing online? Will it be, if not presently? The videographers are working on it. We will post here with directions as soon as they are. Invite all High Schools secular organizations in the USA to send students to participate next year in the contest at the Freedom Plaza, Washington DC, close to the Horse Statue(Statute of the Polish American Hero Kazimir Pulawski), max 3-4 minutes, speech not readings. For winners $500, $400, $300, $200, and $100 (5 places plus Dinner together after ceremony or maybe for all contestants from other states?). Organize official collection money for Awards from organizations and individuals that will be published on Ingersoll Webpage. Congratulation for you SL and keep going! Will this be an annual event, or was this a one-time item? If recurring, when will registration details for the 2010 event be available? We are planning a contest for 2010. We are looking for an outdoor locale with less noise. Possibly on the National Mall. Will there be a 2011 contest? It’s Oct 18, 2011. The end of the world, or at least 2011, is upon us. Sorry, there is no Ingersoll Oratory Contest scheduled for fall 2011. The Committee would like to plan one for the spring or sometime in 2012.